Product prices and availability are accurate as of 2019-04-11 23:54:05 EDT and are subject to change. Any price and availability information displayed on http://www.amazon.com/ at the time of purchase will apply to the purchase of this product. 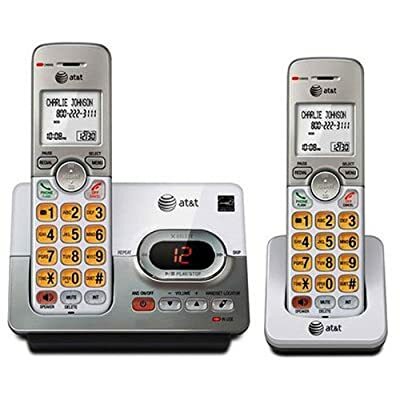 The AT&T 2-Handset Answering System with Caller ID & Call Waiting is a pleasure to use! The speakerphone allows both ends to speak-and be heard-at the same time for conversations that are more true to life. The LCD on each handset is extra large for easy viewing. High-contrast black text on a white background provides for an easy-to-read screen to view incoming Caller ID or review call history. The lighted keypad also allows for easy dialing in low-light conditions. Enlarged font and extra-large, backlit keys make the keypad easy to use. This feature is especially helpful for those who are visually impaired. The phone system can be expanded to a total of 5 handsets.